To check out some of these small bookstores, head to SAN NICOLAS (the central area which is located west of Ave 9 de Julio), and focus your attention patricularly on Corrientes between Ave Libertad and Ave Callao and also on the area directly north (Lavalle, Tucuman). That’s where you will find lots of specialized little nooks (specializing in everything from education to medicine) and a few larger ones, similar to Shakespeare & Co in New York. The most famous of the pack is Gandhi (Avenida Corrientes 1743), although it’s probably pushing the definition of a nook. Another Ateneo location (the one most frequently mentioned in guidebooks) is Florida 340, but I was too lazy to go in since I kind of dislike Florida street in general. There are several other branches as well. 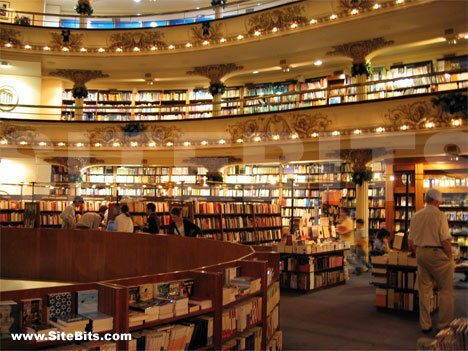 Another big name in the city is Librería Rodriguez (Sarmiento 835) which sells books in English.